Premier walking tours company Calcutta Walks has restored an old building and turned into the most awesome bed & breakfast. Located in the heart of the city, near Shyambazar 5 point crossing, 5 Radha Kanta Jeu Street was a Bengali family home belonging to the Majumdars and was built in 1926. Part of the house was acquired in 2015 by Calcutta Walks and they have turned it into a heritage bed & breakfast. The conservation architect Akhil Ranjan Sarkar has kept the original structure of the building intact and used old materials in restoring it. But the limelight has been stolen by artist Swarup Dutta who has decorated the building in a style that Kolkata has never seen before. The Calcutta Bungalow has 6 rooms. Each room is named after an area of Kolkata, such as Patuapara, Sahibpara, Darzipara, Boipara, etc. Each room is decorated in keeping with its name. So the Muchipara room is decorated with equipment cobblers use to make shoes. The Darzipara room features antique sewing machines. But even outside that, every little thing that you associate with Kolkata, the common things that you see on the streets, such as those green shuttered windows, the colourful nylon “bajarer tholi”, those irritating “chongas” that are blaring at every pujo pandal, have all been used as decorations all over the building. Shahebpara’s bathroom has a massive copper bathtub. It’s the only room in the entire property to have this. Next to the bathtub is an antique apparatus used to heat water using sunlight! But what happens on cloudy days? Don’t worry, your water still comes from a modern water heater. But that machine completes the antique look, transporting you back in time. Cooking utensils have been turned into chandeliers, even the switches will remind you of old Kolkata. This is Kolkatak kitsch on a mammoth scale. Is this the most atmospheric bed & breakfast in the city? Quite likely. They even have a green Hindustan Ambassador to ferry guests around! We cannot think of anything to fault with this gorgeous place. For anyone visiting Kolkata who wants the most immersive experience of the city, this is a great choice. 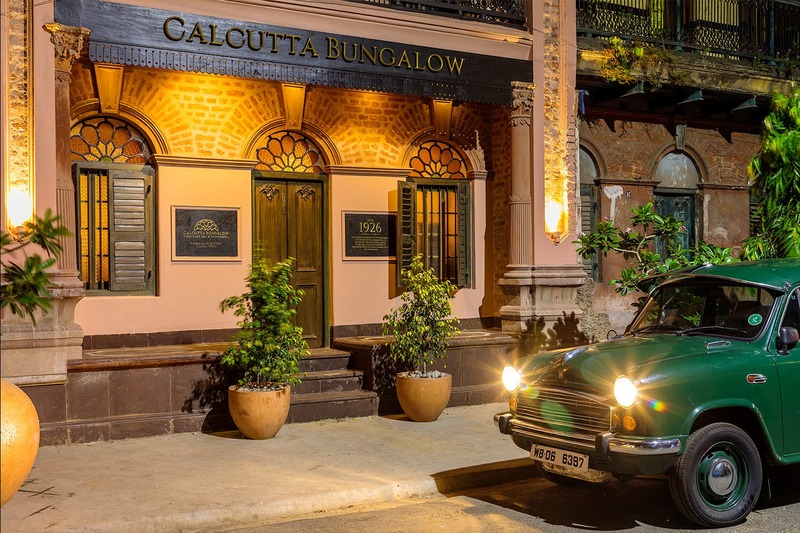 The Calcutta Bungalow currently targets only visitors but there are plans of starting up a rooftop café by the pujas so locals can also enjoy this beautiful building. You can write to this email and book a stay: bungalow@calcuttawalks.com.